To celebrate the first anniversary of the Star City+ motorcycle, TVS have launched a special limited edition. The TVS Star City++ Gold Edition is priced at Rs 48,934 and is nearly Rs 5,000 more expensive than the regular motorcycle with an electric start. 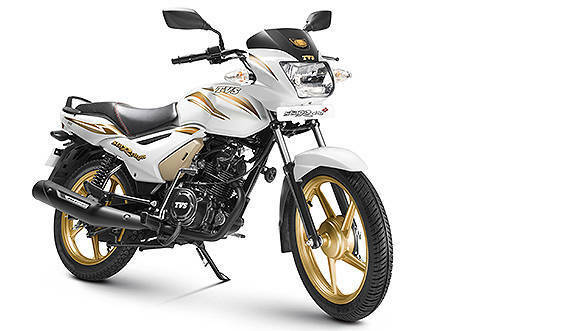 Changes in the Star City+ Gold Edition include, as the name suggests, gold graphics and white colour combination, tubeless tyres, underseat USB charging provision, dual textured seat with red stitching, beige coloured side cover, red coloured shockers, gold alloy wheels and gold 3D TVS logo on the fairing. K N Radhakrishnan, president and CEO, TVS Motor Company, said "We have launched the Special Gold Edition TVS StaR City+ to commemorate the completion of one year of the extremely successful TVS StaR City+. This variant builds on the superiority of TVS StaR City+, with gold theme styling along with new features like tubeless tyres and a USB charger. It endorses our commitment to introduce exciting products for our customers through continuous product innovations. We are confident that this Special Gold Edition TVS StaR City+ will also be a huge success with our customers." There are no changes in the engine. The trustworthy 109.7cc EcoThrust engine still produces 8.3PS/8.7Nm with a claimed efficiency of 85kmpl. While at it, TVS could have done well to add a front disc brake to the motorcycle.